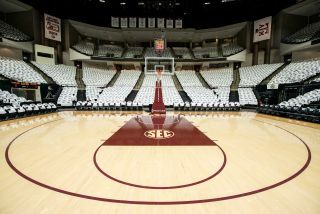 Texas A&M basketball fans are getting a fresh perspective of each game this season, courtesy of five new AJA RovoCam UltraHD/HD HDBaseT cameras installed throughout Reed Arena. From high stakes shots to three-pointers, alley-oops, and memorable crowd choreography, the compact block cameras capture all of the in-stadium action, which is displayed on a 54-foot by 24-foot video board, one of the largest among NCAA Division 1 schools. 12th Man Productions, the university’s athletics video production arm, is responsible for both the live video board broadcast and a live stream of each game to a popular sports network’s digital app. The RovoCams are located under the tip-off, under the video board, on top of each basket, and on top of the production booth in Reed Arena. Each camera captures 1080i 5994 from the Ultra HD high-resolution sensor, and all are mounted to robotic heads, except the tip-off camera. Footage is sent to a PC running VISCA-based command control software in the production booth, where a team member controls the camera moves. Zoom controls are used for close-ups on players, plays and the crowds, while Iris controls adjust light for shots with shadows. RovoRx-SDIs receive the RovoCam signals over category cable and the SDI outputs are then converted to fiber and sent two miles away to a control room. They are run through an Evertz EQX video router for electrical conversion and sent back to the stadium and/or a broadcast truck, and are recorded for replays, in-game highlight melts, or marketing materials. For editing post-game, the team uses Avid Media Composer bays housing AJA KONA desktop I/O cards. AJA Distribution Amplifiers are also tapped for a replay system.